← The Final Judgment Day! Who rules your life? Is it you, your spouse, girlfriend or boyfriend? Does your boss rule your life? Does society or your work rule your life? Do traditions rule your life, or is it your pastor or priest? Do presidents rule your life or a political party? Or does God or Christ rule your life? Is this Christ my King, my Ruler? But where is this Christ found? Is it not the Supreme God within us, also called the Christ, or our True Self? This is who I believe is our master but whether we choose to master the idea and live by it is a choice we make on a daily basis. A few days ago I repeated throughout the day lesson #324 from the workbook of A Course in Miracles; “I merely follow, for I would not lead.” The idea was a reminder I would follow the One Who mysteriously knows the way, the Christ or the King within. And so with us; we think of ourselves as just common sinners with more or less abilities than others but certainly not equal to the Divine God. And yet that equality remains who we are as much as we try to disown and run from it. Within these mortal and imperfect bodies that rust and wear out so quickly is the diamond of Eternal Royalty, the King of Kings, the Christ Self of Who we are. You ARE the Christ. I once heard a story of a Jewish monastery where several men were to live together in prayer and contemplation. But tension and jealousies began to arise and it was hard for the Abbot to quiet it. Worried about the future of the monastery, he started a rumor that spread quickly that one among them was the coming Christ whom they were all awaiting! As the rumor spread, each man began to look at the other as if he were the expected Christ. It changed the whole attitude in the monastery as loving kindness, respect and compassion were displayed more deliberately toward to one another. So it can be with us within a large or small group, groups which at times can be seen as places of tension and disrespect toward others. We too can come to the concept that each one is a “Christ Bearer” and we will see attitudes and actions change. What if parents saw all their children as great contributors to society being successful and well-rounded? What if parents lived the model of Self mastery with order, forgiveness and tender compassion toward themselves and all others? This was the model of the man named Jesus and many others throughout history including the Buddha. We can meditate on and remember these models to perpetuate a world of increasing love and peace. Jack Kornfield tells the story in an African tribe in which the women, upon learning that they were pregnant, would compose a song to celebrate the growing child within. She would sing the special song several times a day as she worked and reflected on the growing and developing child. Later on the day when the child was born she would sing the song and then each day to her child. It would become the theme song for the whole child’s life. When the child died the song would again be sung at the funeral. It was a song of love instilled within the person from his loving mother from conception to the end of the life journey. May we come up with the song of life and peace in being the Christ for our times. May it be a song of humility, compassion, forgiveness, nonviolent “protests” and thankfulness for all things; for each other, for our history, for our Presbytery, for our pastors, and for our future whether it be long or short. I am the Christ who is King of my Life, now and ever more. And in your deepest Self, you are too! Summary of talk offered at the First Presbyterian Church of West Seneca on November 25, 2012. 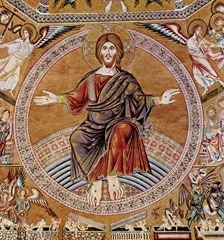 This entry was posted in Religion and tagged Christ the King. Bookmark the permalink.